Like to wish all my readers, a very warm happy holidays and merry Christmas. I don't watch a lot of Bollywood cinema but yesterday I went with friends to go see 3 Idiots - a movie about lives of 3 engineering college students during the four years in school and then the life afterwards. Having spent my formative 4 years at IIT Kharagpur, the oldest and best (in my completely biased and probably untrue opinion since they are all awesome) of the Indian Institutes of Technology - I was transported back more than a decade in time. Let me summarize what I learned from the movie about how life and aspirations are evolving in India, the effects of the global pipes (Cisco calls it the Human Network), and what this should mean for education here in my adopted country USA (or the country that adopted me!). This transformation was clear in the movie. The "hero" of the movie was a kid who enjoyed learning for learning's sake - to discover & invent, despised learning by rote - the curse of India education for decades, and goes on to teach kids. 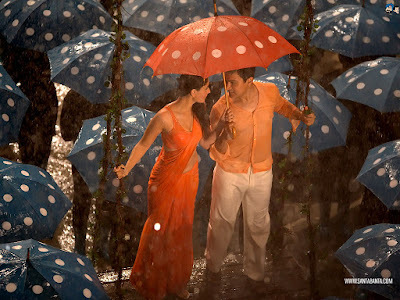 And yes, he gets the girl (the one in the orange Sari above). Nandan Nilekani talks about this at length in his book Imagining India - that India has a demographic dividend but for it to pay off, the country must invest in education. Whether the government is doing this well or not, the individuals definitely are. As the over-the-top melodramatic scenes depicted with tongue-in-cheek humor in the movie show, the 3 kids come from diverse economic backgrounds with the 2 poorest coming from families where there biggest (and probably only investment) is in the future of their kids. This is true in America too - I know of several families where college education is where all the savings go. But in India, 2 trends have made this remarkable - 15 years ago, most colleges were government run and so you either got in (1 in 1000) or you had to go attend a lame school teaching you curricula that was relevant 30 years ago. Today, there are private schools that will cost you an arm and a leg but teach you what you want to learn - computers, telco, management skills - and in English. The aspirations have changed too. In two ways, with a diverse (and somewhat less noticed in the west) economy - Indian students no longer are confined to careers in medicine and engineering but can go be newscasters, photographers, animators, storytellers ... and earn a decent living doing that. Secondly, the poorer sections of the society are no longer willing to live with words like fate & destiny but are doing all they can to change it - by sending their kids to the best schools they can afford - which is far worse than most schools here but better than no education at all. Christmas is a great time to reflect on the year gone by, and as I watched this movie with a group of closest friends - I felt blessed and grateful. I remembered my IIT buddies from days at Kharagpur (India) where we had little in terms of conventional comforts - 100 degrees heat in summer was common with no air-conditioning (except in computer labs), erratic water supply, and dorm food nightmares. But we had friends, lots and lots of them. The bonds we formed are till this day some of the closest. So as I close out this year, I am thankful to IIT for the education it gave me, the friends I found there, the friendships and hospitality of my adopted country (thank you North Carolina and California) ... and to my mentors. One of these days, I will write a post about the 7 mentors that changed my life. Till then, go get yourself a (subtitled in English) copy of 3 Idiots (Netflix queue), or better still go watch it (with subtitles) at a movie theater near you. I enjoyed the movie but also felt that the plot attempts to romanticize the situation a bit too much. Movie attempts to show case the education system as a hollow rote based learning system, which may not be completely true especially for IIT. It suggests that competitiveness kills the curiosity, which is not true always. Thanks, Anshu, for a great post! Glad to see that India is finally awakening to the new realities of the material world! Happy New Year! Nice to read an IITian's perspective on education. The underlying message - success chases knowledge, rather than success as an end in itself - is also powerful and uplifting. As an aside, it was confirmed that Aamir Khan's connection with education is more than skin deep. Taare Zameen Par was another excellent foray into education.